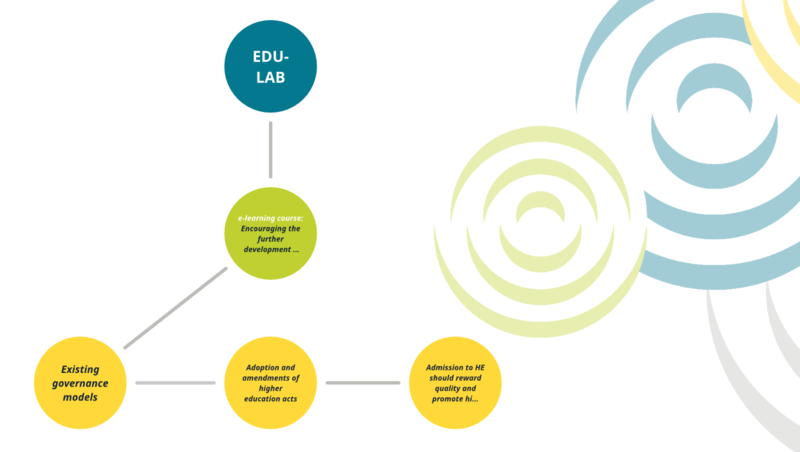 The goal of EDU-LAB ELCs is to create a greater awareness of the possible benefits of linking education to employment in the Danube Region and offer an overview of the possible steps that could be taken to achieve this. During the 1st year of implementation of the project EDU-LAB, the participating project partners have designed e-learning courses (ELCs) in order to enable stakeholders to contribute to better linking higher education to employment. The e-learning courses show a variety of best practice examples for linking education to employment in the Danube Region. By pointing out successful alignments between higher educational offers and the needs of the business sector, stakeholders will be stimulated to look for own solutions and find out what legislative and institutional bottlenecks they need to overcome at national and regional level. These 4 e-learning courses are addressing all the three relevant stakeholders groups of the EDU-LAB project: educational institutions, business and national public authorities. The e-learning courses are designed to support stakeholders that are interested in introducing more professionally oriented study programs in order to better respond to the current and future needs of employers. With the help of the e-learning courses, project partners and external stakeholders will learn from the best presented best practices and move forward with closer linking education to employment in their home areas. The developed e-learning courses will also facilitate the implementation of the pilot activities that will take place within the framework of EDU-LAB project in the Slovak Republic, Bulgaria and Serbia in 2018 and 2019. 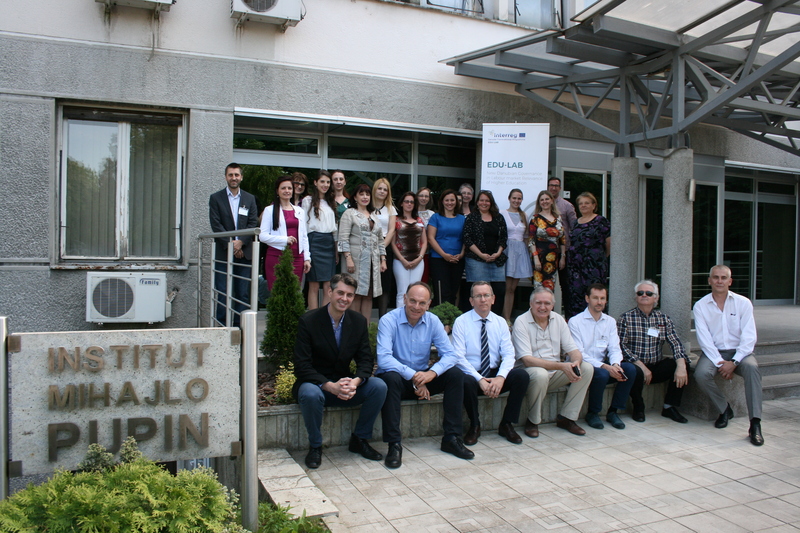 The following EDU-LAB partners were involved in developing ELCs: European Foundation for Education, Technical University of Sofia, Institute for the Study of Societies and Knowledge, Bulgarian Academy of Sciences, Lucian Blaga University of Sibiu, Technical University of Košice, University of Maribor, John von Neumann University, Mechanical Engineering Faculty (University of Sarajevo), German-Slovak Chamber of Industry and Commerce, Automotive Industry Association of the Slovak Republic, Institute Mihajlo Pupin and Chamber of Commerce and Industry of Serbia. The responsible partner for this activity was Institute Mihajlo Pupin. All involved partners were divided into 4 working groups and each working group was creating 1 ELC. Therefore, the e-learning courses are designed through transnational cooperation, integrating the inputs based on working experience of partners from 8 countries from the DR.
Each e-learning course is divided into themes/modules and sessions. The materials provided are in form of power point presentations, videos, pdf document and concept maps. The table below presents main themes (T) or modules (M) of the developed ELCs. The ELCs produced can be used free of charge after registration on the platform (http://jpo.imp.bg.ac.rs/edu-lab/) and receiving a feedback email with a link for setting the password. The platform is easily maintained, and the courses will be further improved through time which ensures sustainability of this project result. The ELCs can also be used as sources or training material to serve the goals of other projects and education initiatives in the region. 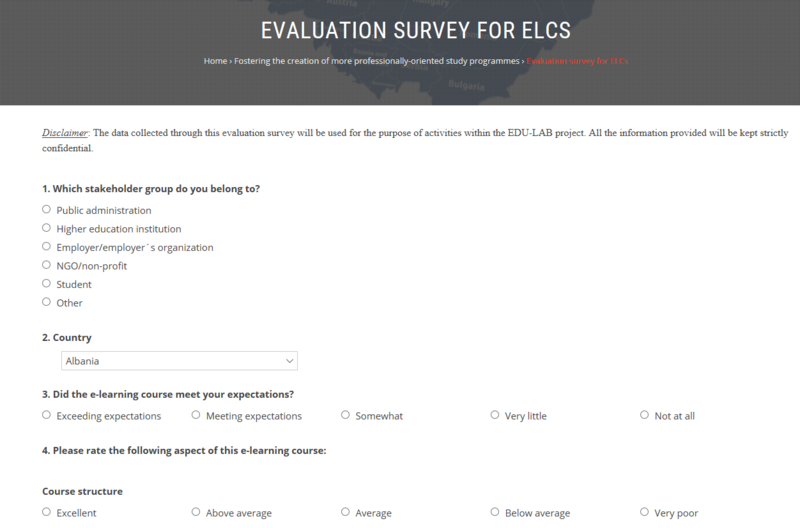 All e-learning courses include an evaluation survey to collect the feedback of the users. This feedback, if relevant for a majority of the partners, will be used to improve the content by providing additional relevant information and examples of good practice. The e-learning courses will be tested and improved within the training sessions and pilot activities of EDU-LAB project. EDU-LAB partnership invites all stakeholders from the Danube Region and beyond to attend and evaluate the e-learning courses!